Today’s episode comes as a question from Claire. Thank you Claire. I don’t actually know if you know but Claire has a difficult customer or has had some difficult customers. But, she asked me to tackle this one. Yes, we certainly have some. This is what we do. The first thing is to change your mindset. Now a customer is a customer. Without customers you don’t have a business. They pay your bills. They are in charge, not you. You have no rights other than to be respected. They have a right to expect something for their money and to expect at least what they were expecting. If they misunderstood, what they’re going to get is because you haven’t explained it or your staff haven’t explained it in a, a good enough manner. It’s not their fault they misunderstood. Now of course, it may be, but if you change your mind to thinking no it isn’t, you’re going to constantly improve and your customer service levels will be fabulous and you’ll stop getting those difficult customers. Now the next thing is that customer may be having a bad day, maybe a bad hair day. They may have gotten some bad news. It doesn’t really matter. Of course, that’s not really acceptable, however, what can you do? They are still a customer, someone who has paid you money. They need to be treated with respect. They need to be calmed down but they also need to let their rant happen. Now something important here is, some customers actually want to rant. They want to let off steam. They want to let it off at you because they’re probably doing it on the phone or via email because it’s easy to do that because they don’t have to actually see you or meet you. So they don’t have the emotional tie. They can’t look in your sad puppy eyes and see your tears, etcetera. They don’t know you. They don’t know what you’re going through. They want to rant. They do not yet want to hear, we’re so sorry, we’ll give you everything you want. Let them rant first of all. Now the next stage once they’ve got through their rant is, don’t give them some stock answer, we are so sorry that happened. Sound genuine. So when you answer and when you apologize, use what they are complaining about in your apology sentence. So for instance in our case virtually all of our problems are our carriers, our shippers in my fire safety business, so we’re restricted. Only a few who carry fire extinguishers because they’re pressurized goods. But we still use the best and we’ve tested them all… it’s not just the price. So quite often, they have misrouted it to a wrong depot so it arrives late or they haven’t delivered it in time. So we don’t say, well I’m very sorry but it’s not our fault, it’s the carrier. We take full responsibility. But when they’ve had a rant, you will say, I am so sorry that we’ve let you down with the shipping. It’s frustrating, personally it’s my worst nightmare when I order anything online, so I’m with you. It’s bad. The next thing is, is that we don’t let any customers down. We want you to think that we deal with your problem correctly. So tell me what can I do to make it right. What can I do to repair your faith in us so that you can understand that it is a one-off mistake and that we have apologized and made it up to you. What can I do? Quite often the customer will be stunned and won’t have an answer. However, if they say for instance, in that case well I don’t expect to pay for the shipping. You’ll say, well, that’s a given. I was going to do that for you anyway. It’s more of… Is there something else or would you just like me to, to surprise you. Now the customer is turning because the customer’s calmed down and they’re thinking, well, I don’t get this when I complain to people normally. So give the customer what they want. We can afford to say, to make sure that you have faith in us and will try us again when you next need this. How about if we refund fifty percent off the cost of the goods as a good will gesture, we’ll do it straight back to your card right now. Will that make you happy? Ask them, are they satisfied. And if they say, that’s not enough. Give it all. Now you’re going to think, we can’t do that for everyone. How many complaints do you get? But do you see what I mean? You’re going above and beyond. There is that old adage that… that when people like you they’ll tell a couple of friends. If people don’t like you, they’ll tell ten friends. Other things to consider. When that person is on the phone or on the email is ranting, he could be a reporter doing a test order for a magazine or for TV program. You’re going to say, really, what’s the chances of that? Well, let me say, it only takes one. Do you want to be that one on the BBC news feature that says when investigated online customer service and here’s one company we phoned and we put this to them about… look what they said. Do you want that to be you? You don’t know who they are. You don’t know what their next order is going to be. But I can tell you that a customer that has complained and has been over impressed by the way you deal with it is more likely to buy from you again and tell all their friends than someone who just bought from you and just got what they expected. Use it as a sales tactic. If necessary, surprise them. Send them flowers. Send… you have their address… send them a box of chocolates. Send them a bunch of flowers. Can you not afford that, seriously. Don’t be a tightwad. Please them. They are your bread and butter. I’ve answered your question Claire. Anyway, it’s a Monday. It’s time for a book of the week. This one you’ll enjoy it, Claire. 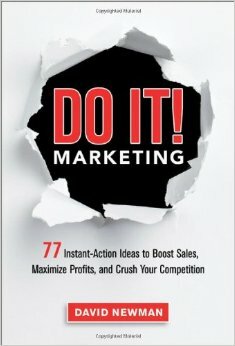 It’s called, “Do It Marketing” and it’s by David Newman. I don’t think David’s written any other books but he’s a marketer, he does the kind of thing I do. He has seventy seven ways of easy marketing. And it says, instant action ideas to boost sales, maximize profits and crush your competition. What more could you ask for? Seventy seven of them in one book. And what’s a book going to cost? Ten dollars? Get it on audio book include anything and listen to it. If you can’t get one idea from that, then we’ll get back your ten dollars. You’re not listening. Go on read it. You’re going to wait for the next one? 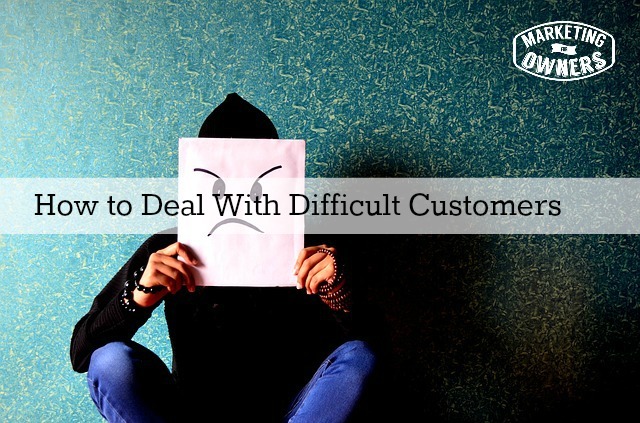 What difficult customers do you have?